I'm trying to login in my gmail account. After entering email and password I have a Google page with enter point. But when I press the Continue button - nothing happens. 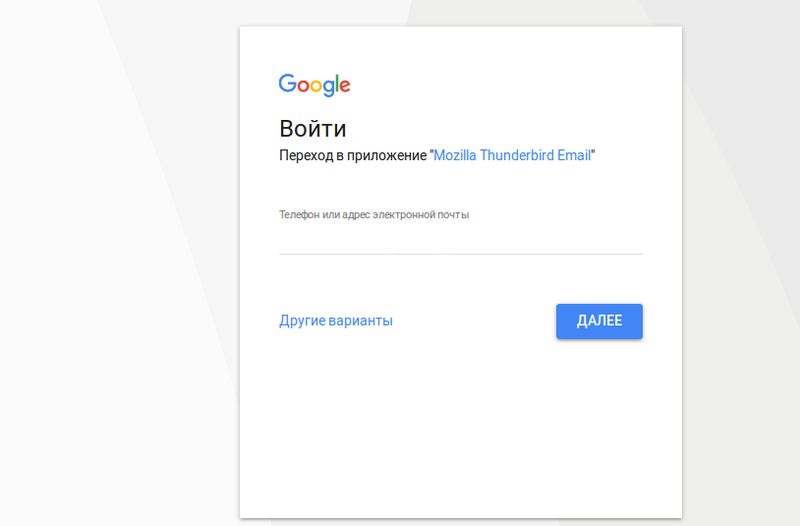 Open Thunderbird and try to login in Gmail account with 2-auth. Same problem here. Google pushed a new login screen for 2 factor authentication and some apps stopped working, like Epiphany, Gnome Online Accounts and Thunderbird. I was told that the 52.1 version of Thunderbird fixed this issue, but I'm not using since it's not in the Ubuntu Zesty repositories yet. If this can be confirmed, maybe just pushing the newer version of Thunderbird to Ubuntu repos is enough. In Windows 10 with thunderbird 52.0.1 this doesn't happen. I don't use 2 factor authentication. Also confirming behavior. Not 2FA enabled, but can't click on "continue". Confirmed. This bug still exists in Ubuntu Artful (17.10) as of now. Cannot login via OAuth2 (=standard method) because button is unclickable. Major changes to Google account required in order to get basic functionality (sending/recieving E-Mails) with Thunderbird. Lightning (calendar addon) doesn't work either. No workaround for this. Regular people will not be able to get their E-Mail software working. This needs to be fixed for the upcoming release before the Debian Import Freeze happens in 4 days! New version of Thunderbird in the Debian repository ("testing" or newer) fixes the bug. Please import, thanks. Finally found a workaround that works. 2.) Click on "Add to Thunderbird" button. This reinstalls the Provider for Google Calendar. 3.) After restarting Thunderbird, the Lightning calendar addon is usable again. We still need to import a newer version of Thunderbird into the Ubuntu 17.10 repository to address this bug, as not only Lightning is damaged, but the E-Mail login procedure itself. Debian Import Freeze has already happened. Since this is a serious usability bug, maybe an exception can be made? This problem still persists on Ubuntu 17.10 updated right now. Is this still an issue now that Thunderbird 60.4 is the currently supported version?